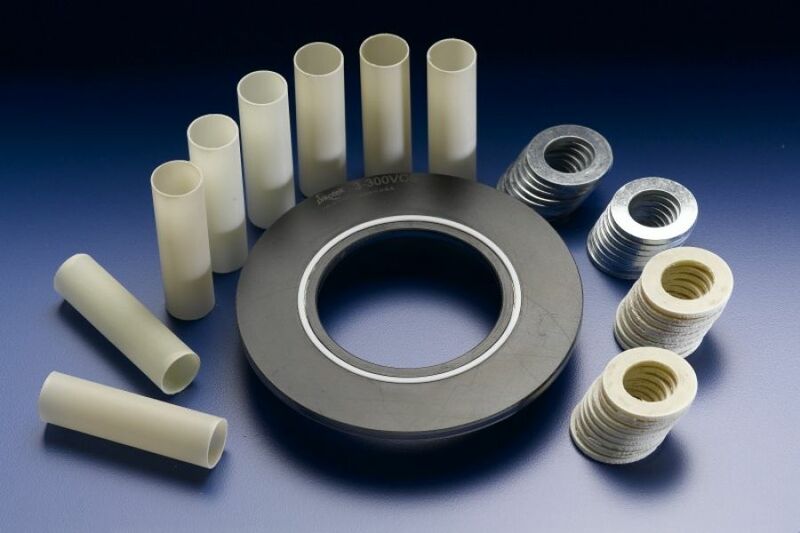 The Pikotek® VCS gasket provides exceptional insulating and general sealing performance in aggressive material applications. The VCS gasket is suitable in all services up to and including ANSI 2500# and API 10,000# classes. Tandem seal versions available 6” and up and as standard for 24” and up - contact GPT Industries Engineering for other size availability. Dielectric Strength: 500 VPM Max. One isolating and sealing gasket, VCS Type “F”, 0.260” thick or .308” thick, 316 stainless steel core retainer laminated on both sides with a G-10 fiber glass reinforced laminate containing a precision tapered groove to accommodate the controlled compression of a PTFE spring energized seal. Sealing element placement shall accommodate either flat, raised or RTJ face flanges. The PTFE seal shall be spring and pressure energized. The G-10 retainer shall have a 800 volts/mil dielectric strength and a minimum 65,000 psi compressive strength. The I.D. of the flange isolating gasket shall match the bore of the flange in which it is installed.